China, Japan, Hong Kong, Taiwan, and Singapore represent 5.61% of Argentine wine exports. Whereas, the two main markets account for 4% of the total bottled wine exported by the country. Wine consumption is concentrated on some destinations, and it is anticipated that there will be an exponential growth for Argentina. Wines of Argentina continue to promote Argentine wine in the Asian market. Apart from the fairs and specific events in which it participates, they have strengthened their position by opening an office in Beijing, in April 2012. Moreover, Wines of Argentina together with Ease Scent, the most important platform of Chinese wine industry training, launched the first Argentine Wine School and online marketing promotions department. The “Argentina Wine School” was established in April, 2013 as a partnership between Wines of Argentina and Ease Scent with the collaboration of the EAS (Escuela Argentina de Sommeliers). The main objectives are: to boost the understanding of the ‘Vino Argentino’ brand among Chinese wine buyers, to allow Chinese customers to truly comprehend Argentine wine and its regions, to enhance the interaction with Chinese consumers and improve the reputation of the wines in China. Ease Scent, the exclusive partner in China of Wines of Argentina, arranged an influencing foundation ceremony for the school, inviting leading journalists from the Chinese wine media. After the ceremony, the Argentina wine professional course – Level 1 was set up in 6 different cities in China: Beijing, Shanghai, Guangzhou, Xiamen, Chengdu & Nanjing. At the same time, to promote Argentina’s news and culture in online media, a marketing promotion at the biggest wine site in China, Wine.cn, was set up at wine.cn/TopicsArgentina. Wine company executives agreed that Malbec leads the ranking among the best performing grape varieties in Asia, because apart from being Argentina’s signature varietal wine, it is very versatile to pair with a wide variety of dishes. Likewise, Torrontés also keeps pace and is highly appreciated by Asian consumers, since one of its aromatic features is the ‘lychee’, a well-known fruit in Asia for which they have strong preference. This grape variety boasts a great potential to compete with New Zealand and Australia’s Sauvignon Blancs, according to the executives of the wineries. It is worthy to mention that Wines of Argentina carries out numerous training and communication activities. Furthermore, in order to get closer to these potential markets, they continue to organise frequent hospitality activities for the media, sommeliers, and the trade of Asia, sharing their extensive knowledge of Argentina and its wines. 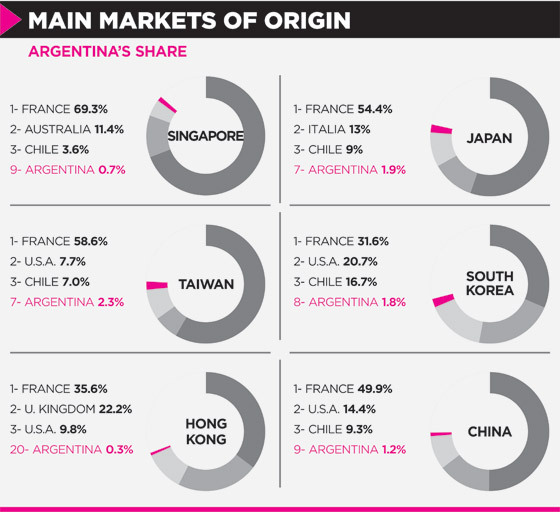 Argentina does not have a great representation of brand and business volume in the Asian market. However, in China, the country grew by 15% in volume and 1% in value during the January-July period of 2013, attaining 240 thousand 9-litre cases and USD 10m in terms of turnover, making it the most important market for Argentina in this region. China has reached #6 in the ranking of the most important markets for Argentina, followed by Japan, in #10. The ranking also includes Singapore (#25), South Korea (#27), Taiwan (# 28), Hong Kong (#29) and other Asian countries.